To design a trackball that mounts in a wooden cabinet without a plate or mounting kit, Ultimarc started from scratch instead of modifying an existing unsuitable unit. This way they were able to address all of the problems with current designs, namely the difficulty of fitting to a wood panel, plus the poor "out of the box" spin of many trackballs. 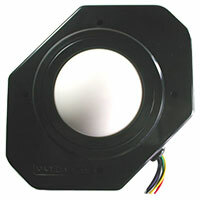 The only arcade trackball designed for mounting in a wooden panel with no plate or mounting kit.